Do you have struggling readers? It may be lack of phonological awareness skills! Phonological Awareness is the understanding that oral language can be divided into smaller parts that can be manipulated. Understanding phonological awareness prepares students for later reading instruction which includes phonics, word analysis and spelling. It is the great umbrella that incorporates many skills. Phonological Awareness follows a continuum from easier to harder but the learning doesn't follow it in order. Each task is difficult in its own way and the learning flows at different rates for each learner! Check out the skills in order from easiest to hardest on my phonological awareness skills page. The less complex activities of Word Awareness includes tracking words in sentences and enjoying rhyming and alliteration through stories and poems. The Syllable Awareness involves tapping, counting, blending, or segmentation a word into syllables. Onset-rime Awareness is the ability to produce a rhyming word that depends on the understanding that rhyming words have the same rime (ending sound). Being able to tell if words rhyme or not (thumbs up if cat and hat rhyme or sound the same at the end) is much easier that producing a rhyme (Tell me other words that rhyme with cat, hat, ________). 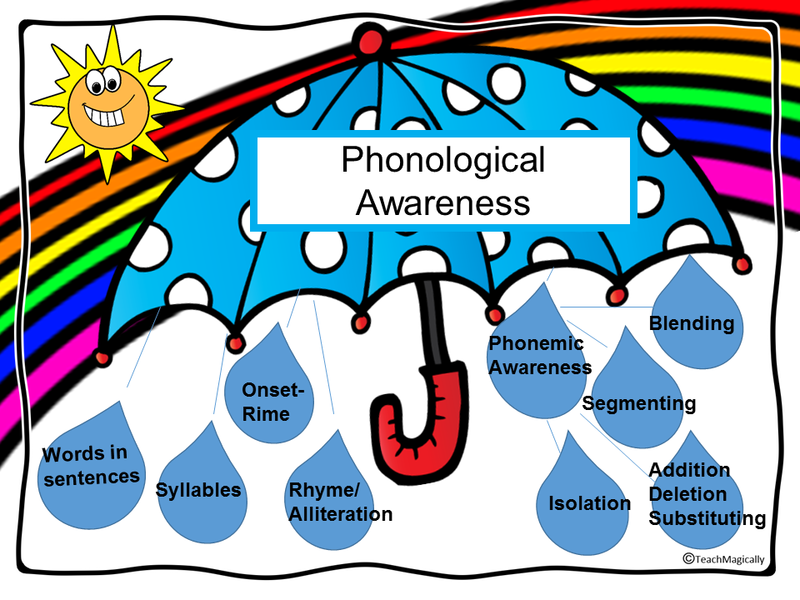 The most sophisticated level of Phonological Awareness is Phonemic Awareness, the understanding that words are made up of individual sounds or phonemes. Manipulating these phonemes by blending, segmenting, or changing individual phonemes within words to create new words is extremely difficult. There are many fun activities to help with Phonemic Awareness. 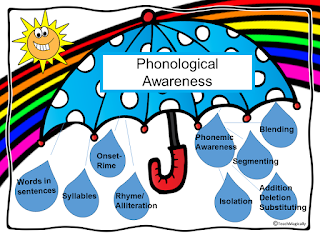 Phonemic Awareness is more highly related to learning to read than are tests of general intelligence, reading readiness, and listening comprehension (Stanovich, 1993). Be sure to check these skills if reading seems difficult!